Like so many bakers I know, I keep a stash of recipes that I have every intention of trying someday. 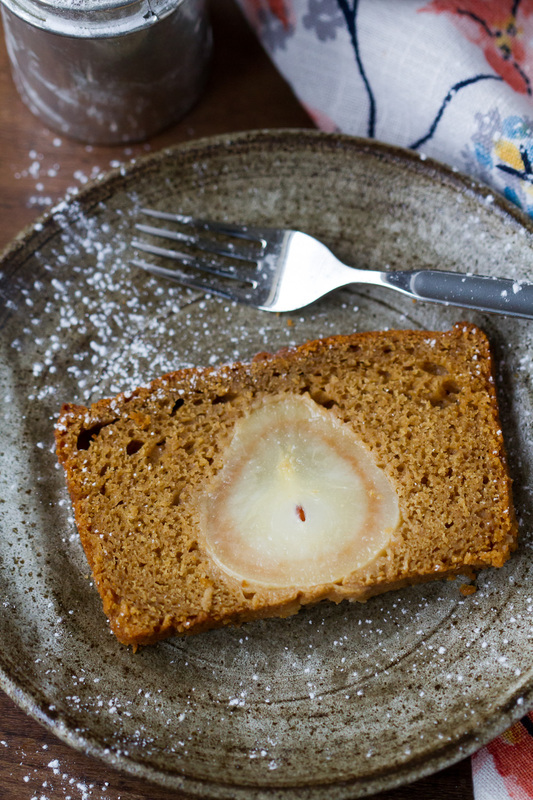 Many remain in a file that I forget to retreive, but with the holidays approaching and images of gingerbread everywhere, I was reminded of this beautiful cake baked in a loaf pan that I always wanted to try. To be honest, I had my doubts that I could replicate the perfect image displayed in the recipe, but I decided to take a chance and give it a try. Much to my astonishment, it worked like a charm! Easy and effortless, no expert baking skills were required. And oh, what a stunner! 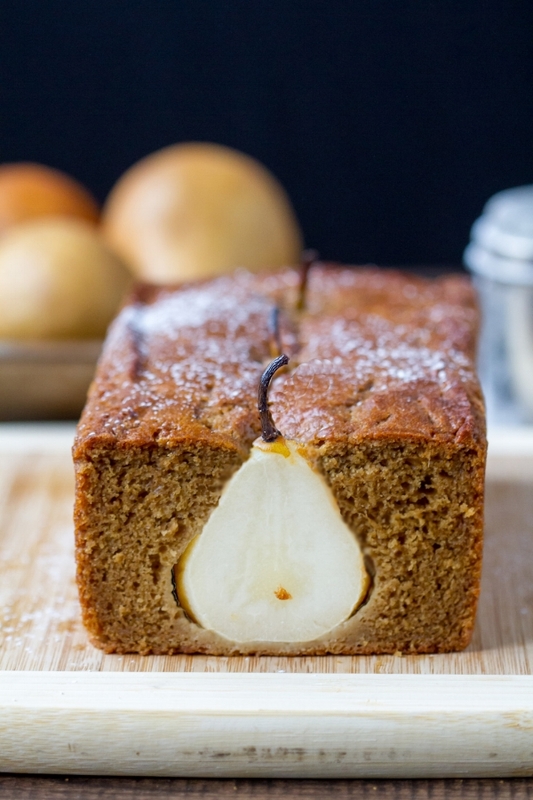 The white pears against the dark gingerbread couldn't be prettier. What a wonderful dessert to make or gift for the holidays! To begin,you poach the pears. I used Seckel pears as they are smaller than Bosc or Barlett, and I thought they would be more suitable for a loaf pan, but really, any variety would work just fine. Peel the skins, but leave them whole with the stems attached, and simmer lightly in white wine, sugar, and spices. 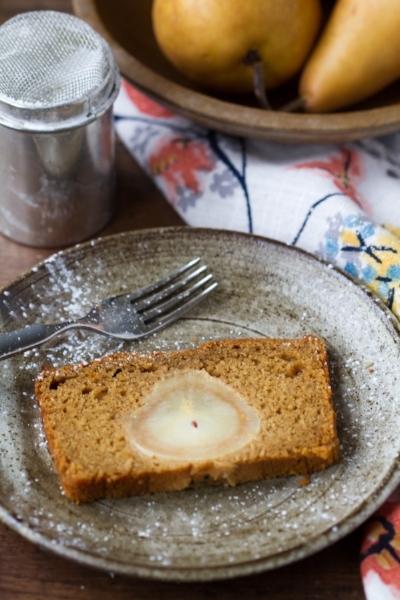 Set aside to cool before placing into the gingerbread batter. Add all the ingredients to a large saucepan or small dutch oven. Bring to a boil, then cover and reduce the heat to a gentle simmer. Cook pears for 20-30 minutes, until easily pierced with a fork but not mushy. Do not overcook. Remove from the poaching liquid and allow to cool. Preheat oven to 350F. Butter a 10 x 5 x 3" loaf pan. Beat the butter, molasses, and sugar together in the bowl of an electric mixer with the paddle attachment until light and fluffy. Add the eggs, one at a time, and the vanilla extract. Beat for 3 minutes. Stir in grated ginger. In a separate bowl, combine the flour, baking powder, baking soda, cinnamon, and salt. Slowly alternate folding in the flour and yogurt, beginning with the flour until combined. Do not overmix. Pour the batter into the prepared loaf pan, then gently place the pears, spacing them evenly into the batter, bottom side down, so they are standing upright. 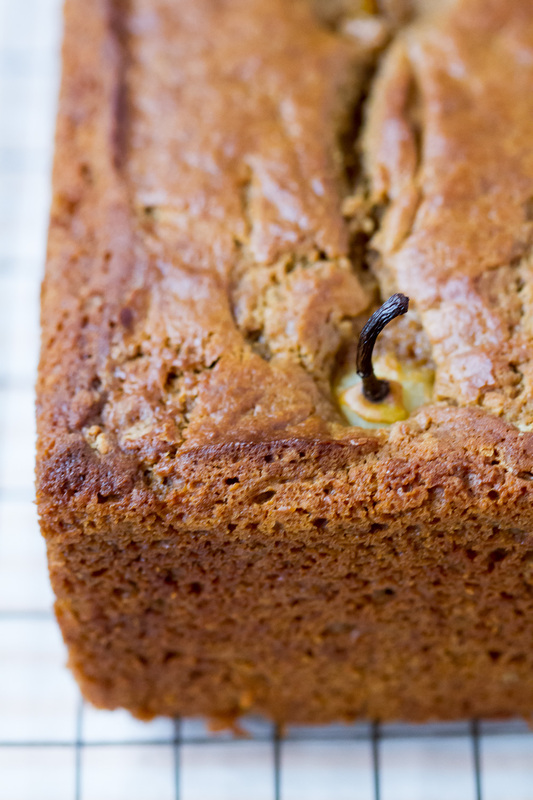 Bake for 50-60 minutes until a cake tester or toothpick comes out clean. Allow to cool in the pan on a rack for 20 minutes. Gently run a knife around the edges to loosen and carefully remove from the pan. Recipe slightly adapted from Honest Cooking.